Air Marshal KK Nohwar, Air Officer Commanding in Chief (AOC-in-C), Eastern Air Command (EAC), IAF is presently on a four - day visit to various IAF Bases in the State of West Bengal. Air Mshl Nohwar has today i.e. on 09 Apr 2010 visited Air Force Station Barrackpore near Kolkata. Earlier on 07 and 08 Apr 2010, he visited the IAF base at Kalaikunda. He reached IAF base Barrackpore on 08 Apr 2010 afternoon and later today he would also be visiting AF Station Panagarh, before proceeding back to EAC Headquarters at Shillong. At Air Force Station Kalaikunda he was received by the Base Commander Air Cmde DK Vashisht. 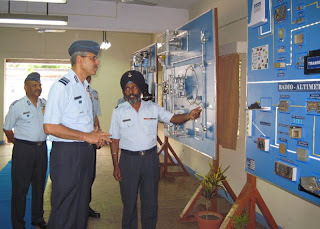 The Air Mshl inspected various operational and support facilities at the base. He expressed his appreciation on the preparedness of the base and was extremely happy to see the infrastructure matching the international standards. During his interaction with the Air Warriors at Kalaikunda he said that the base had become very important due to regular joint exercises at the base with foreign Airforces. At Air Force Station Barrackpore Air Mshl Nohwar was received by the Base Commander Group Captain Pankaj Bishnoi. The Air Mshl took a stock of Air & Ground defences at the base. He also visited the training facilities which impart theory knowledge about the AN-32 and Mig 21 systems to aircrew and groundcrew. Air Mshl Nohwar inspected various communication facilities at the base. Air Mshl Nohwar is accompanied by his wife Mrs. Anita Nohwar. Mrs. Anita Nohwar is the president of Air Force Wives Welfare Association at the regional i.e. command level. She interacted with the members of AFWWA at AF Stations Kalaikunda and Barrackpore and took a stock of welfare activities initiated at these bases. Mrs Nohwar also visited and appreciated the School "Umeed- Asha Kiran" at AF School Barrackpore meant for the special children.